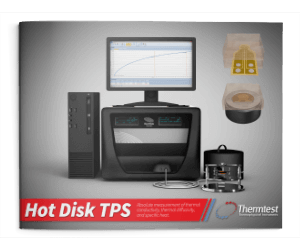 Hot Disk TPS 500 S | Thermtest Inc. The low-cost Transient Plane Source TPS 500 S for transient measurement of absolute Thermal Conductivity, thermal diffusivity and specific heat from 0.03 to 200 W/mK. The TPS 500 S Thermal Conductivity Instrument is designed for testing the thermal transport properties of solids, liquids, pastes and powders, including various types of geometry and dimensions with the use of special two-sided or single-sided TPS sensors.